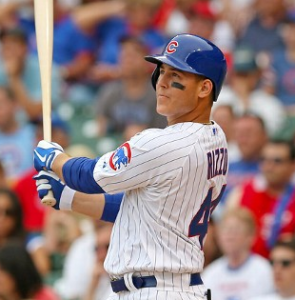 The Chicago Cubs signed first baseman Anthony Rizzo to a seven-year, $41-million contract on May 12, 2013, and, for a few months, it looked like a coup. Rizzo played his 162nd game as a Cub on June 26, and at the end of play, he had 37 doubles, two triples and 27 home runs over that span. For the 2013 season, he was hitting .256/.343/.474, and he was playing terrific defense. Thereafter, though, Rizzo had a miserable season. He would finish at .233/.323/.419, only slightly above the league-average output. Not the type of production for which one hopes from a first baseman. He managed to rack up 65 total extra-base hits for the year, in 160 games, but the shape of the distribution—40 doubles, two triples and 23 home runs—left him a bit short of elite power status. What went wrong? Good question. As it turns out, most of the answer is that Rizzo couldn’t buy a hit when he hit the ball on the ground. Rizzo had a .172 BABIP on ground balls in 2013. League average is around .240, so there’s a chasm between normal hitters and Anthony Rizzo in this regard. Only Edwin Encarnacion, Nick Swisher and David Murphy came in lower. Though Encarnacion had a fine season, and Swisher (the most similar to Rizzo in the bunch) still returned some value, Murphy came in with a .282 OBP, and lost his regular spot in the Texas Rangers’ lineup. In order to forecast Rizzo’s future, we have to figure out whether his struggles on grounders are real, or if they’re bad luck, or what mixture of the two it may be. Is a low ground-ball BABIP an obdurate artifact of his approach and skill set, or did he catch some bad bounces? Shifts work best against left-handed pull hitters, of which Rizzo is certainly one. Batters pull most of their grounders (and Rizzo is no exception), which (for left-handed batters) means the fielder who gets to the ball has a short distance to throw it. Most power hitters aren’t looking to hit ground balls, so when they do, it figures that the pitcher has often won, and the ball might be more likely to be weakly met. On the other hand, it’s difficult to sustain numbers this bad, as the year-by-year leaderboards indicate. A quick glance shows just how little staying power severely low grounder BABIP has. The 92 entries listed (the worst 23 qualifying batters for GBBABIP for each year) include 80 different players. There are extreme power hitters, and slap hitters, clods and Coco Crisps. Even Mark Teixeira, the only player to show up on the list for three straight seasons, never hit .172 on ground balls. Rizzo might or might not have an unfortunate propensity for grounding out, but even if he does, we should expect a significant rebound, and his solid power, strikeout and walk skills will shine much brighter with even a modest bump in BABIP. By the way, Rizzo’s closest comps in that table—guys like Morrison, Davis, Lind and Hosmer—tend not to be guys who show up a second time. Rather, the repeat offenders are mostly switch-hitters, like Matt Wieters, Jimmy Rollins, Mark Teixeira and Ben Zobrist. While pull-power lefties may be at a systemic disadvantage for defensive reasons, it also feels like there’s some intrinsic disadvantage to having the platoon advantage, when it comes to GBBABIP. There were 16 switch-hitters in the table, all told, 20 percent of the total and about four more than we would expect, given a normal distribution of batter handedness. To me, there’s no reason to suspect that Rizzo’s BABIP on grounders will stay that low. Taking the 204 grounders he hit, and bumping his BABIP on them to .210, that’s eight extra hits, one of them a double. Instead of .233/.323/.419, Rizzo would have posted a slash line of .246/.335/.434. Bad luck cost Anthony Rizzo the right side of a .750 OPS, and probably made a significant dent in his perceived value. I wrote up Rizzo’s peculiar year back in September, and stand by what I said then: Rizzo is still a solid player, and he’s going to bounce back in 2014, even if part of his BABIP sag was a true loss of hard contact in the second half. Now, I want to move beyond Rizzo a bit, and look at this ground-ball platoon phenomenon on a team level. I observed above that there are a disproportionate number of switch-hitters on the yearly leaderboards for ground-ball suffering. There are also (if only just) more lefties than we would expect. In a sample so small, the difference isn’t statistically significant, but I wonder whether the numbers still have something significant to say. It’s not just that there are a lot of left-handed and switch-hitting batters on the list. It’s also that many of the non-switch-hitters are platoon-protected. Nate Schierholtz and David Murphy in 2013. Skip Schumaker, Jeff Keppinger and David DeJesus in 2011. Gerardo Parra in 2010. And if you lowered the playing-time qualification threshold, you could add another name to the list: Luis Valbuena, at .206. That’s four and a half Cubs who, when they put the ball on the ground last season, had worse than a 21 percent chance of reaching base, in Rizzo, Schierholtz, Valbuena, Alfonso Soriano and Darwin Barney. Soriano is, of course, gone. Barney might have a true-talent BABIP in that range, because he makes so much very weak contact, preferring those choppers and dribblers to whiffs. The other three players listed, though, should get at least a small bump. As a team, the Cubs hit into a bit of bad luck on ground balls last season. How could that small bump become a big one? The answer isn’t in a swing adjustment or a change of approach, by any of those guys. The answer is that the Cubs have to get on base more. In 2013, the Cubs’ .300 team on-base percentage was the third-worst in baseball, and second-worst in the National League. Yet, they also led the National League with 487 extra-base hits, including 297 doubles. Add it all up, and the Cubs took the fifth-fewest plate appearances with runners on base of any team in baseball, and the third-fewest with a runner on first and less than two outs. That matters, as it turns out, because BABIP on ground balls to the right side of second base (where Rizzo, Schierholtz and Valbuena all hit most of theirs) rises by roughly 40 points when there’s a runner on first, according to an article by Dave Allen in The Hardball Times Baseball Annual 2013. The Cubs didn’t put runners on base, especially in front of this group of lefties, and that contributed to the tough seasons they each had when they hit the ball on the ground. Don’t worry about the platoon issue. It’s informative, if true, that batters might have a harder time getting the ball through the infield against opposite-handed pitchers, but the superior power and strike-zone control hitters show when they have that edge more than makes up for that issue. Don’t get upset by groundouts from Ryan Sweeney, Justin Ruggiano, Donnie Murphy, George Kottaras or anyone else in 2014. They’re simply the price the team has chosen to pay in order to hit plenty of home runs, maintain the platoon edge and maximize the production of marginally talented players. The real takeaways here, for the Cubs, are that there’s regression (the good kind) coming, and that the quickest way to assuage the frustration of seeing groundout after groundout is to put some people on base and apply pressure to the defense.